Cornell University’s Rose Goldsen Archive of New Media Art is an archival repository and study center with a broad array of international new media art and its documentation. In 2002, I founded the Archive, which I continue to develop and curate in the Cornell Library’s Division of Rare and Manuscript Collections. The Goldsen Archive profits from this Division’s commitment to the public access of its materials and growing interest in digital preservation. In addition to significant holdings of internet art, anchored by the LJUBLJANA INFOS 2000 collection, which I curated with Teo Spiller, and the collection of CTHEORY Multimedia, which was produced in the Cornell Library under the curatorial direction of me and Arthur and Marilouise Kroker, the Goldsen Archive is the repository of the annual competition in New Media Art administered by National Video Resources with assistance from the Rockefeller Foundation (some fifty sets of dossiers and work samples annually), as well as the holder of perhaps the world’s most extensive collection of art on CD-Rom, a collection anchored by the CD-Roms from 23 countries in the exhibition, “Contact Zones: The Art of CD-Rom,” which I toured internationally from 1999-2004. The Archive also houses extensive holdings of new media art and documentation from the Pacific Rim. In addition to individual artworks and collections on CD-Rom, DVD-Rom, internet, and digital video from China, Hong Kong, Taiwan, Japan, Australia and the broader Pacific Rim, it features two specialized collections of immense value for the understanding of contemporary Chinese art. The Wen Pulin Archive of Chinese Avant-Garde Art includes 360 hours of digitized video documenting contemporary Chinese art events and installations since 1984. The Yao Jui-Chung Archive of Taiwan Contemporary Art consists of some 8,000 digitized images of paper and postcard invitations to contemporary art events in Taiwan over a twenty-year period, as well as archival footage, stills, and video of new media events and installations. I have been struck by how these collections and the socio-cultural conditions of their production have expanded my sense of the mission of the Goldsen Archive as “archive,” as well as the cultural conditions and promises of digitality itself. 2These collections have resulted from my many collaborations with the Taiwanese curator, Shin-Yi Yang, who is the Beijing Director of and Art Director of Artist Commune/63 in Hong Kong, my curatorial work in Australia, as well as my consultant role in the planning of "Dissection: A New Epoch in Electronic Inter-action-an International Multimedia Art Exhibition," one of China’s first exhibitions dedicated to multimedia at the Museum of Macau in 2000. In the context of Wen and Yao holdings in the Goldsen Archive, which are both ongoing and flexible projects whose cultural and political implications will be comprehended only as their contents and accessibility continue to develop, the coda of the Future Perfect leads us to ponder the relation of Contemporary Chinese Art to the Question of the Archive in the Age of Digitality. The range of materials stored somewhat haphazardly on these tapes is extraordinary, particularly how it testifies to the rather natural growth of electronic art within the context of contemporary Chinese art. In addition to a variety of artist interviews and footage of work by pioneers in Chinese video, electronic installation, and performance, such as Xu Bing, Song Dong, and Weng Fen, the Wen Archive includes footage of the 1988 performance on The Great Wall for Wen’s television special, “Great Earthquake,” which helped foreground in China the prominence of avant-garde art, 4See Gao Minglu (2004) where he discusses this and other contemporary Chinese artistic interventions on The Great Wall. documentary footage of the infamous Avant-Garde Exhibition in 1989 whose closure helped spark the Tiananmen Square Incident, as well as clips of numerous exhibitions, performance art and rock events that celebrate the subtle integration of electronic performance and contemporary art in China. Also available for consultation is the video shot by the performance artist, Yang Zhichao, who in 1999 secretly taped the 48 hours that he spent under voluntary evaluation in a mental institution. Prominent throughout the archive, moreover, are examples of how frequently Chinese artists turned the electronic apparatus of surveillance against its governmental agents for the purpose of reflection on what Michel Foucault calls cultural archivization writ large— the wide range of disciplinary activity grounded in the archive, from the viewing model of the panopticon, educational standards and artistic conventions to diagnosis, data preservation and tracking (Foucault 1975, 135-230). The rather random assemblage of footage found in some 300 tapes, now readily accessible on one hard drive or on separate DVDs, testifies to the impromptu actions and cross-disciplinary installations that made the electronic and its pulsating rhythms part of the natural fabric of Chinese art well before the post-Tiananmen incursion of the Western art market. The Wen collection itself also positions the video camera front and center at these performance events, as a rather natural piece of performance equipment. The result is that the thought of the archive, or the action of archiving, lies just as much at the center of this momentous art production as did the video camera and now the computer which so frequently seems to be the subject of address by the artists as they perform their work. The act of accumulating footage never ceases to exemplify the archival function that was so clearly articulated by Foucault in The Archeology of Knowledge, a book that appeared in 1969 on the eve of the era of video documentation. “The enoncés of accumulation’s density never cease to modify, disturb, turn asunder, and sometimes ruin” the clear focal point of the images they mean to archive (Foucault, 1969, 164). To some degree, this paradox of the ruinous function of the archive, what Jacques Derrida later termed, “archival fever,” could pertain to the original BETA tapes themselves, which silently and perilously remained hidden for years, out of sight from the potentially interested scholars, artists, and even authorities while accumulating layers of dust and electronic interference in a corner of Wen’s apartment. As users of the Wen collection will discover when they stumble upon the many seemingly arbitrary sequences of video footage stored randomly on the tapes, which now are neatly contained in the algorithmic coda of a portable hard drive, the process of electronic accumulation and its leveling impact on the preciousness of artistic “originals” is crucial to any comprehension of the complex socio-cultural legacy of contemporary Chinese art. One young mainland China artist who has gone to great lengths to fuse the discourses of electronic art, artistic practice, and digital cultural is the vibrant figure, Feng Mengbo, who joined last fall’s Future Perfect Conference held at Cornell to celebrate the Goldsen Archive’s Chinese holdings. Armed with the incongruous tools of computer, brush, and video camera, Feng Mengbo has transformed the ubiquity of video gaming into the discourse of contemporary Chinese art. A masterful player of Doom and Quake, Feng is one of Beijing’s most hotly wired artists who straddles the enigmatic interface of Maoist revolutionary culture and global computer gaming. Fueled by China’s paradoxical fascination with global technologies, his game based paintings, CD-Roms, net art, and installations trace a playful and archivally Pop path between China’s youth and elders, West and East, global capitalism and Chinese communism. Somewhat ironically, painting was the medium for Feng’s first translations of video gaming into the popular culture of postTiananmen China. In a Pop appropriation of the revolutionary tradition of political realism, Feng inserted Maoist luminaries and histories into the generic mise-en-scene of his painted stills of computer games. Two stunning series of paintings, Taxi! Taxi!—Mao Zedong I-III and Game Over: Long March, bemuse spectators with incongruous images from contemporary Chinese culture. While the image of Mao hails a taxi instead of saluting the Red Army, the cultural heroes of the Long March are depicted as fighting alongside the ninjas and dinosaurs recognizable to the video warriors of the West. While clearly Pop, the political ground of Feng’s painterly presentations generates both laughter and reflection, as the spectator ponders the cultural paradox so central to his playful motifs. Where is Chinese art heading at a moment when the icon of Mao is painted not to be hailed, but to hail, to solicit a cultural journey alongside the fast moving icons of global, electronic culture? These ludic combinations of Chinese history and video culture, which Feng continues to paint, led in 1996 to his ongoing experimentation with interactive digital works that continue to break new ground in international new media art. Still the most sustained mainland experimentation with new media, his interactive works extend across the divide of CD-Rom, installation, computer game, and internet art. Feng’s digital creations quake with the creative flair of his first CD-Rom, My Private Album, whose interactive slide collages juxtapose memorabilia from three generations of his family who passed through the challenging benchmarks of modern Chinese history. What we now realize, looking back on this work of 1996, is that Feng’s CD-Rom intersected telepathically with similar projects being developed at that same moment by Western artists. New media artists such as George Legrady (US), Keith Piper (UK), Norie Neumark (Australia), and Grace Quintanilla (Mexico) also turned to the interactive depths of the CD-Rom to archive the pathos of family and national histories. Feng might suggest that they strove in common to transform the seductive call of interactive gaming into an engaged blend of the hurts of the past with the pleasures of contemporary computing. This certainly would be true of Feng’s recent infatuation with the Shareware version of Quake III Arena. As he played this game online for months, he recorded his competitions with other global players and then transformed these tapes into his Documenta 11 installation, Q4U. Visitors found themselves dwarfed by three interconnected projection screens displaying their manipulation of a game whose protagonist had been morphed through computer modeling into a figure of Feng Mengbo himself. Feng confuses the fictions of gaming culture with the fantasies of militarized time travelling as his pixelated figure traverses the screen while sporting a video camera, in one hand, and a plasma gun, in the other. The artist’s animated apparition suspends his figure between autoportraiture and action figure, a composite image of the two ideals from his childhood, to be an artist or a soldier in the People’s Liberation Army. On a broader, global level, we might also appreciate how the insertion of Feng’s authorial figure into the exploding landscapes of militarized fantasy also foregrounds the naive identification of young internet gamers with the intoxicating machineries of virtual warfare now sustaining the occupational military campaigns in Iraq and Afghanistan. It could be argued that Feng himself falls prey to this ludic blind spot, since he frequently disavows the political agency of his artwork. Indeed, Q4U ‘s next transformation will permit the user to move about on a digital dance pad to control the video game, as if breakdancing to drive the aimless beat of his arcade violence. This latest proposal may provide the key to the seamless transport of Feng’s persona into the morphed uniformity of global flow where his infatuation with digital culture might break free of the West’s glorification of his Chinese artistry. But Feng’s multilayered projects consistently belie any such wired romanticism and even his own distancing from “political art.” Always signified by the authorial figure who splashes across Feng’s screen is his own complex inscription in the technological interface specific to the People’s Republic of China. Even when bedazzled by Q4U, spectators familiar with his work will recognize the authorial persona who created his earlier CD-Rom, “Taking Mountain DOOM by Strategy.” Here the heroes of the Beijing Opera meet the masters of the video game Doom. As Feng greets the user as a roaring stand-in for the infamous tiger in the MGM-logo, he populates the electric landscape of DOOM with the revolutionary heroes and tales celebrated in the popular tale Taking Tiger Mountain by Strategy, which appeared as a novel, opera, and film over the course of three decades. Here glorious tales of military and political strategy face off against the strategic sharpshooters of Doom in a modern pastiche ripe with cultural paradox. The haunting return of recent Chinese history becomes particularly clear in Phantom Tales, Feng’s intriguing 2001 contribution to the Dia Center for the Arts series of Artist’s Projects for the Web (www.diacenter.org/mengbo/). Visitors to this site discover a poignant homage to the People’s Republic of China that disturbs the numbing pleasures of internet surfing and gaming. While two flash movies animate Chinese picture books from 1969 and 1972 that glorify the Revolution’s response to economic oppression, a third frames Feng’s fascination with technology in direct relation to his patrimony as a child of the Cultural Revolution. “The Technology of Slide Shows” animates the 1982 People’s Liberation Army book, How to Create and Play Slide Shows. Feng’s simple flash movies of the ghostings of revolutionary history may suggest that his projects in new media carry lively traces of a complex, political balance between art, culture, and technology. While Chinese politics may be muted in Q4U, the energetic resonance of its technological traces, from the camera to the digital archive, is omnipresent in the work of this leading new media artist from contemporary China. Were we to seek even a broader combination of the conventions of art and archive in artistic practice, we could turn our attention to the Taiwanese conceptual artist, Yao Jui-Chung. Over the past decade, Yao has turned the lens of his camera and his exhibitionary practice onto the historical conundrum of China/Taiwan. Somewhat akin to Feng who positions himself within the representation of Chinese new media culture, Yao frequently inserts himself in his extensive photographic documentation of historical events and locations. In his ironic “Recover Mainland China Action” project (1997), he stands proudly in front of the monuments on the mainland as if to reclaim them parodically for Taiwan. In the stunning installations that are part of this project, eerie light shows illuminate minimalist sculptural transformations of China’s proudest monumental forms. The colorful casts and electronic illumination of his installations lend life and playfulness to the more traditional, archival cast of his black and white photos. In “The World is for All-China Beyond China” (1997-2000), his photographs display the artist standing with his hands raised triumphantly in front of the gateways to Chinatowns throughout the globe: Brisbane, Paris, Toronto, London, New York, Victoria, Vancouver, Yokohama, San Francisco. For his 2002 project, “Long March,” Yao documents himself standing on his hands in front of sites revered in China for their importance to the Long March, such as The Red Army Hill in the city of Zunyi, Guizhou Province, the Residue Jail in Chongqing where the KMT secret service executed 180 Communist prisoners on November 27, 1949, and the Mao-tai Brewery in Guizhou Province, where Red Army soldiers cured their wounds and soothed themselves with wine. The photographs displayed for exhibition then depict a reversed image in which Yao, now suspended in the open air right side up, “holds up” these cherished Maoist sites, or in his words, “accomplishes the feat of ‘shifting the universe.” In his 2005 digital video project, “China Town-Dizzy,” the digital apparatus incorporates his earlier bodily motions by reversing and flipping upside down the Chinatown gate in Yokohama, the site of the world’s largest Chinatown. Finally, his decade long project, “Taiwan Ruins,” documents photographically the historical, industrial, and natural ruins of the island in a way that provides a chilling documentary of the forgotten sites that mark this island’s complex history. 5This work is documented in Yao's book, Roam the Ruins of Taiwan (2004). Given his artistic investment in the cumulative effects of the archive and its transformation through various practices of electronic art, it should not be surprising that the bulk of the materials in the Yao Archive chart the history of the exhibition of contemporary art in Taiwan. In addition to selections from Yao’s work, as well as the history of performance art in Taiwan about which he has authored an important monograph, the Yao Archive contains some 8,000 digitized images of invitation postcards to contemporary exhibitions in Taiwan since 1989. Personally collected by Yao, either in person at galleries or through the mail, the cards provide an unusually detailed history of contemporary art in Taiwan, from art imagery to the conceptual trajectory of solo and group exhibitions throughout Taiwan. The admirable range of work attests to the importance throughout this period of video and digital art, whether of the stunning group sound exhibitions curated by the leading new media collective, ET@T, or the combination of performance and video art by young Taiwanese artists such as Tsui Kuan-yu, whose work I will discuss below. What’s also telling and important is the range of conceptual projects throughout the recent history of contemporary Chinese art as well as the presence there of many of the mainland artists prominent in the Goldsen Archives, such as Xu Bing, Song Dong, Shu Leah Cheang, and Feng Mengbo. Indeed, perhaps keeping with his own playful interest in an “All China Beyond China,” Yao’s archive is much more aggressive than Wen’s by documenting the extensive array of Chinese art across greater China, from Beijing and Shanghai to Macau, Hong Kong, and Taipei. Action Recording and The Repetition of Archival Event 6I have published a slightly different version of this section on Tsui in the catalogue of his recent exhibition at the Chelsea Art Museum, "Action Recording: The Repetition of the Event and the Dissonance of Mimicry’s Archive," in Shin-Yi Yang (2005), 8-9. When it comes to electronic art and its relation to archiving, Yao and his curatorial collaborator, Shin-Yi Yang, have insistently turned my attention to the work of Tsui Kuan-yu, the Taiwenese artist who has developed in his work a complex approach to archivization that contributes in exciting ways to my own thinking about the role of the archive in the age of electronic art. The roots of the artistic events of Tsui Kuan-yu that are featured in the Goldsen Archive go back to his 1996 performance, “Imitation/Mimicry.” Viewers of this performance witness a performer bend and shape his torso and limbs to approximate the contour and position of various natural bushes and landscaped trees next to which he performs. Throughout this piece the artist contorts his body to be in consort or dialogue with natural landscape forms and their architectural repositioning. Tsui Kuan-yu’s performance takes art back to nature in a way that imitates the harmony of landscape, the elegant simplicity of historical painting, and even the aesthetics of landscape architecture. The conceit of “Imitation/Mimicry” derives from the artist’s particular fascination with biological mimicry. His corporeal contortions approximate the process of natural mimicry through which various insects are able to adjust their color and texture to blend in with the environment. Tsui speaks passionately of his interests in the individual’s “interjection” in environments as well as “a given environment’s capacity for tolerance.” Aligning his art with the artistic tradition evoked by the surrealist thinker, Roger Caillois, the artist experiments with the assimilation of human actors in the fluid space of nature. In this context, Tsui’s art imitates mimicry. Tsui’s fascination with mimicry deeply impacts the performer’s relation to space as well to identity. The performer’s interjection in environment suggests a giving over of self to nature or something of an extension of the boundaries of subjectivity into the architectonics of space. Callois spoke passionately of how mimicry opens the human actor to the “devouring force” of space. Space pursues them, encircles them, digests them. … It ends by replacing them. Then the body separates itself from thought, the individual breaks the boundary of his skin and occupies the other side of his senses. He tries to look at himself from any point whatever in space. He feels himself become space… He is similar, not similar to something, but just similar. And he invents spaces of which he is “the convulsive possession. (Callois, 1984, 30). Something of the convulsiveness of the similar possesses the performer throughout Tsui’s recent work. In a humorous 2001 trio of sequential works, “An Array of Eighteen Copper Guardian Coins in Shao-Lin, to penetrate…,” the actor is possessed, or penetrated, by series of physiological events that underscore the psychic and corporeal extensions of mimicry’s uncertain possessions. In the performance subtitled, “the Spontaneous,” the actor appears in various environments only to be overcome by the sudden expulsion of vomit. In the series subtitled, “the Penetrative,” he spasmodically crashes headfirst into various unyielding obstacles and surfaces, from animals and statues, to polls and video walls. Finally, in “the Perceptive,” he is struck repeatedly on the back of the head by flying objects that he attempts to name on the basis of their sensual similarity. But his archival attempt to name all of the objects striking his head, from book to TV set, is rendered senseless by the indistinguishable nature of many of the blows (“I don’t know”). These parodic performances, made humorous by their uncanny repetitions, literally invent scenarios that depict the actor’s “convulsive possession” just as their viewers mimic Tsui’s artistic interjection through the affective displacement of laughter. This relation to the viewer is crucial to Tsui who categorizes his work as “Action Art” in order to foreground how performance actively situates the audience in the occupation of space and time, as well as the performer’s reciprocal insertion into the space and action of the audience. His more recent series, “The Shortcut of Systematic Life,” literally enacts such reciprocity of art and everyday life in an impressively wide range of contexts. In “The Shortcut of Systematic Life—Superficial Life,” the actor moves rapidly via montage between various sites. He carries a backpack that contains one-sided suites of clothing that he puts on and discards along the way. Each costume permits the actor to mime the codes of color and decorum appropriate to each circumstance and its articulation within a broader social context of commodity culture and everyday life in a society of global capital. In front of an office building, he puts on a suite. When he arrives at a 7-Eleven Store, he adopts the colors of the company uniform; at a public square, he dresses to match the colorful outfit of those gathered to perform yoga; when he comes to a school, he puts on a student’s uniform; outside a taxi stop, he puts on a driver’s clothing and zooms away in a taxi. Tsui thereby aims to blend in with the environment to produce “an effect of disguise” while yet exhibiting the “dissonance among various pre-established identities.” It is precisely this blend of mimicry with dissonance that lends to Tsui’s work such a productively aesthetic charge. Limitation of critical attention only to Tsui’s widespread emphasis on mimesis would be forgetful of aspects of even his earliest performances to which dissonance is crucial: their inscription on video and their agonistic seriality. Fundamental to his performances is their staging for video as well as the juxtaposition on video of sequences of various related performances whose conceptual depth derives from the dissonance of their seriality. In this context, the mimicry of art performs the agonistic differences of imitation. Contributing to the playful dissonance of Tsui’s “action art” are the structural elements of repetition and difference upon which the artist relies. The repetitive sequentiality of the series itself inscribes the artwork in the ongoing, agonistic display of difference. This viewer is struck by how the continual variation of Tsui’s sequential performances foregrounds more the mimicry of the artist’s theatrical procedures of imitation than any seamless blending in with his environment and the openness of its space. When the performer changes costume in front of exercisers and students arriving at school, his action removes him from the naturalness of the scene as much as it inserts or “interjects” him in color codes of the given environment. We witness these events on the fringe or the surface of ongoing activities; we see them as deconstructive masquerades and mimicry of social customs and cultural practices whose procedures have become naturalized as everyday practice. Even when he joins in common procedures of realistic naturalization, by actually riding a bike or driving a taxi, he openly sports the backpack that reveals his platform of display: the one-sidedness of his costume, into which he easily climbs in and out, as well as his playful presentation of the props of theatricality. The result is agonistic mimicry or dis-play of code as institutionalized performance. While institutionalized behavior may be an ongoing element of the social context of everyday life, whether dictated by the demands of consumer society or the socialized procedures of group exercise, its pre-established identities are shown by Tsui to be no more stable than the one-sided costumes which he puts on and sheds at a moment’s performative notice. It must be stressed, moreover, that the verve of Tsui’s work derives not so much from live performance as from the artist’s “interjection” in the mechanism, procedures, and display of video. What helps to make “The Shortcut of Systematic Life” so amusing or disgusting (depending on whether we’re witnessing a repetitive change of costume or a continual heaving of vomit) is the disjunctive repetition and sequentiality of events as they are recorded and edited on video. We see, as witnesses, the split of time and space, the agonism of temporal and spatial disjunction, marked by the rapid shift of video sequences, just as we move in time with the tracking of camera and the motion of the screen. Keeping with the video-event, the performer frequently moves in and out of screen or sequence. Most notably in “Superficial Life,” he rides, runs, and drives from site to site. The motion of passage is marked by the electronic fissure, by the movement in-between sequences. The corporeal “presence” so crucial to performance makes way for the temporal complexity of video “event,” as it moves between the now of witnessing, the past of the archival moment, and the future of the unfolding track that treats us to the delightful eternal return of the video loop. In essence, the interface with the video event never stops throughout the duration of the installation. It is no coincidence that the accurate translation of the Chinese phrase, “action art,” is “action recording” (Feng 2005). Crucial to this project is the mediation of recording as an action of the archive. Tsui’s video’s diverge from earlier conventions that linked performance and video. His action recordings are strikingly dissimilar to first generation video performances that staged the narcissistic heroism of Vito Acconci and the mournful wailings of Linda Montano. Tsui’s authorial role in video is to serve more as a physical carrier of the archival registry in continuous variation. He becomes the surface medium of mimicry, the discharger of intestinal fluids and their subsequent affect, the head banging apparatus of dissonance, the stationary contortion of natural form, the physical impediment of flying objects. Rather than standing forth as the hero of video art, the performer thus serves as something of a recording device, one that bears the marks of projectile resistance and the motions of cultural passage. At issue is nothing close to the performance of self but the literal recording of action, of event, of passage, of archival bits for subsequent recombination in video display and installation. The performer doubles as an archival prosthesis of archival testimony to the repetition of the event and the dissonance of mimicry’s archive. The videos of Tsui Kuang-yu thus confront the curious viewer with the convulsive possession of archival data and video event. Recorded in action, his video data awaits retrieval by viewers whose witnessing will carry on the enigmatic flow of the dissimilarity of mimicry and the differing agonism of archival event. To think is to question everything, including thought, and question, and the process. To question requires that something happen that reason has not yet known. In thinking, one accepts the occurrence for what it is: “not yet” determined. One does not prejudge it, and there is no security… It would be presumptuous, not to say criminal, for a thinker or a writer to claim to be the witness or guarantor of the event. It must be understood that what testifies is not at all the entity, whatever it be, which claims to be in charge of this passibility to the event, but the event “itself.” What memorizes or retains is not a capacity of the mind, not even accessibility to what occurs, but, in the event, the ungraspable and undeniable “presence” of a something, which is other than mind and which, “from time to time,” occurs. (Lyotard 1991: 74-75). Callois, Roger, “Mimicry and Legendary Psychasthenia,” October 31 (Winter 1984), 30. Derrida, Jacques, Archive Fever: A Freudian Impression, trans. Eric Prenowitz, Chicago: University of Chicago Press, 1998. Foucault, Michel (1969) L’archéologie du savoir, Paris: Gallimard. (1975) Surveiller et punir: Naissance de la prison, Paris: Gallimard. Gao Minglu, “The Great Wall in Chinese Contemporary Art,” positions: east asia cultures critique 12, Number 3 (Winter 2004), 775. Lyotard, Jean-François (1984) The Postmodern Condition: A Report on Knowledge, trans. Geoff Bennington and Brian Massumi, Minneapolis: University of Minnesota Press. 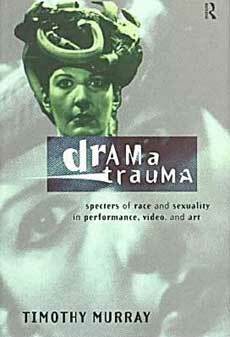 (1991) The Inhuman, trans., Geoffrey Bennington and Rachel Bowlby, Stanford, Ca: Stanford University Press. (2005) “Action Recording: The Repetition of the Event and the Dissonance of Mimicry’s Archive,” in Yang (2005), 8-9. (2006) The Archival Event: Thinking Electronic Art Via Cornell’s Goldsen Archive of New Media Art, Intelligent Agent, vol. 6, no. 2. Yang, Shin-Yi, ed., (2005) You So Crazy: Kuang-Yu Tsui’s Video Works (New York: Chelsea Museum of Art, 2005). Yao, Jui-Chung (2004) Roam the Ruins of Taiwan, Taipei: Garden City Publishing. Timothy Murray is Director of the Society for the Humanities, Curator of the Rose Goldsen Archive of New Media Art, and Professor of Comparative Literature and English at Cornell University. He curates and writes on new media, film, and contemporary art. He is Co-Curator of CTHEORY Multimeida and Co-Moderator of -empyre- listserv. His latest book is forthcoming from the University of Minnesota Press, Digital Baroque: New Media Art and Cinematic Folds.